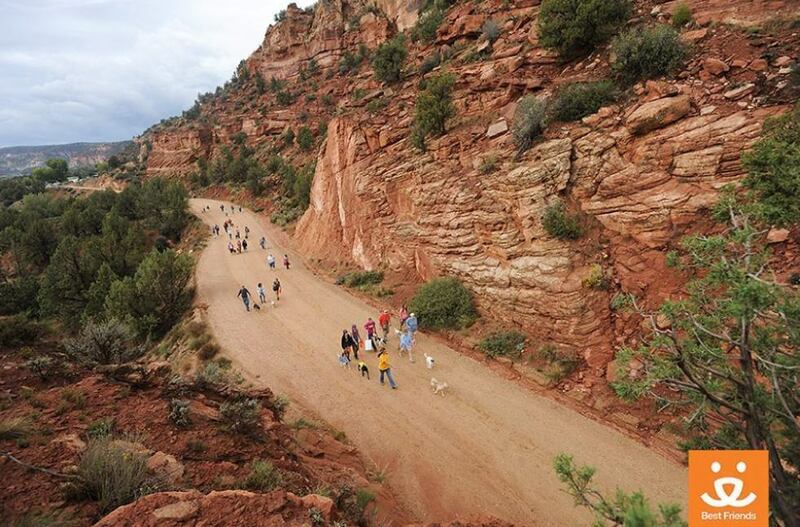 Every day at Best Friends animal sanctuary in southern Utah, cats are fitted up with a harness and leash and taken for an amble through the spectacular scenery. "The reality is a lot of these cats are going to spend the rest of their lives here," says Michelle Warfle, a former aerospace engineer who is now the cat manager at Best Friends Animal Society. "So we need to enrich their life as much as possible. And getting them outside is just fun for them." Best Friends' Utah sanctuary has around 1,700 animals in total -- dogs, horses, pigs, birds and rabbits among them, in addition to the 550-600 cats under Warfle's care. As with dogs, taking cats out hiking helps them burn off extra energy. It helps keep them from getting bored and also gives them the opportunity for one-on-one time with their favorite humans, who may be full-time staff or even sanctuary volunteers. 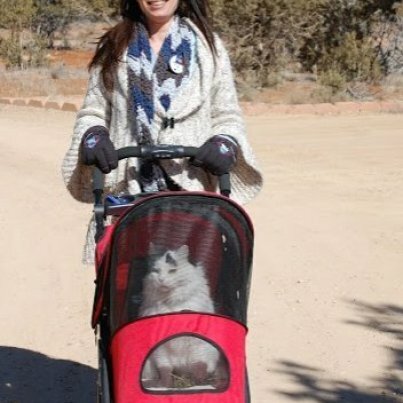 Some of the cats love to go out walking and will spend an hour on the move. Warfle's own "personal cat," as she puts it, enjoys hiking up to about two miles at a time. "And then we have others, they'll go a little bit, find a sunny spot and lay down," she says. "It really all depends on the cat." Warfle started the cat hiking program about half a decade ago. These days, Best Friends cats now go walking around the sanctuary's many existing trails and roads. Work has just begun on a series of paths built specially for the cats. These paths will be open to those who like a good, long walk and will be paved, since they're also designed to accommodate finicky felines who prefer to be pushed around in a cat stroller. 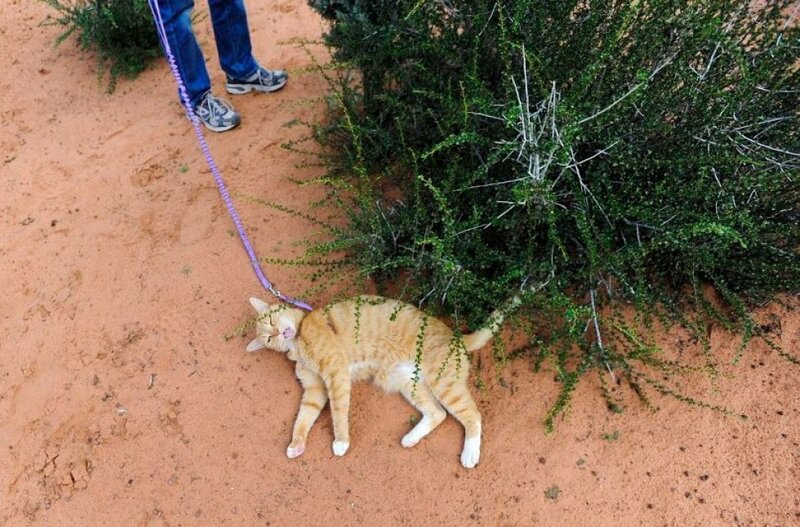 Want to try out cat hiking yourself? Warfle says it's best to start slowly: Put the harness on your cat, let the cat acclimate before attempting to go outside, then go somewhere quiet -- don't start your adventures on a busy city street. Or come volunteer at Best Friends' Cat World. Volunteers can offer their time for as little as one day, or for a few weeks. After a session or two of walking cats alongside sanctuary staff, you'll be given some leashed-up meowsies to take out walking on your own. If you fall in love with a cat, all the better. The sanctuary's animals are, after all, up for adoption. "We'll send the harness with the cat," says Warfle. Find out more about the Best Friends Animal Society on the group's Facebook page. Here's where to get information about volunteering at the sanctuary's Cat World.